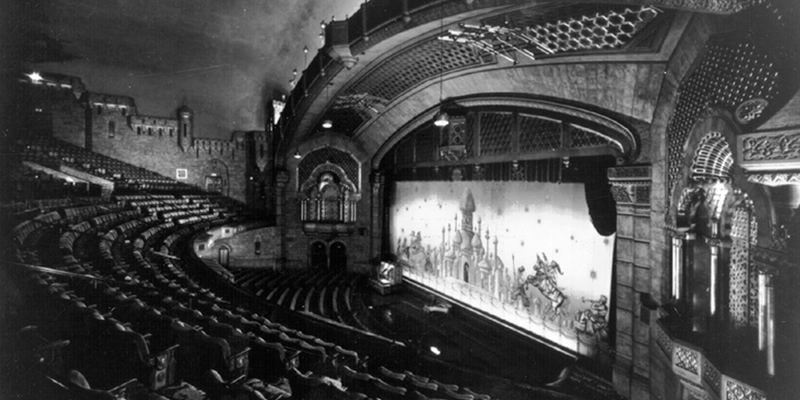 Many claim that Atlanta’s beloved Fox Theatre is haunted by several ghosts. Photo courtesy of The Fox Theatre. The idea that ghosts, spirits and apparitions of the dead are very much alive in and around Atlanta is something plenty of folks find hard to believe, even those who investigate and search out other worldly phenomena. Take paranormal researcher Christina Barber, who founded and runs Casebook Paranormal in Newnan, Georgia. She approaches her research into possible hauntings in a very scientific way, trying to rule out the possibility of an actual haunting. And, considering her field, she’s even very skeptical about the existence of ghosts and spirits. “I believe in the possibility of the existence of ghosts,” she told WABE Digital during a 2016 interview. And so has paranormal researcher Denise Roffe, co-founder of the Southeastern Institute of Paranormal Research. In fact, Roffe has had several “unexplainable” encounters. Unlike Barber, however, Roffe is a believer in unexplainable paranormal phenomena. “I do believe in ghosts. I believe in demons, in negative presences,” she said. Roffe and her team always use audio recording equipment when investigating paranormal activity, and she said, typically, they almost always discover Electronic Voice Phenomena, or EVP, at the site. Electronic Voice Phenomena is defined as “unexplainable audible paranormal events (usually voices or sounds that cannot be attributed to anyone present), of unknown origin, which can be heard and captured” on audio recording equipment. Her team of researchers has also discovered more frightening occurrences. Roffe said she’s witnessed team members’ names called by unknown voices at haunted locations. She said eerie, unidentified and disembodied voices have answered questions before at investigation sites and that so-called spirit voices have even given their names before. Modeled after the ancient temples of the Far East, the opulent and ornate concert hall in downtown Atlanta on Peachtree Street originally opened as a movie theater in 1929. Fox legend has it that several ghosts, if not more, call the historic building home. WABE Digital has learned some people have reported seeing at least two different women and at least one man coming and going inside the theater. One story involves the ladies’ lounge late at night. A researcher inside the lounge with a number of others retells a chilling tale of seeing the apparition of a woman, dressed in 1930s-style evening clothes, suddenly appear out of thin air, only to disappear practically as quickly. The Dupre Excelsior Mill was built in 1890 and has a long history that includes deadly mill accidents and even a tuberculosis outbreak that claimed the lives of several workers. Since becoming a hotspot in the Atlanta music scene during the late 1980s, there have been tales of ghostly encounters with a dark apparition who seems to haunt the Masquerade after hours. Footsteps and screams from an unknown origin are said to have been heard, as well. Recent rumors have it that a coven of vampires call the place home. The old Scoville Hotel in Atlanta is located on Mitchell Street in what’s known as the city’s Hotel Row District, which dates back more than 100 years. 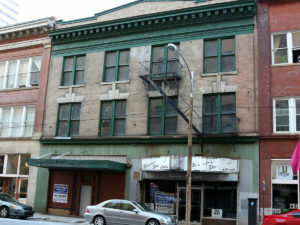 Built in 1905 and still located in Atlanta’s Hotel Row Historic District on Mitchell Street between Forsyth and Spring streets, the Scoville was abandoned sometime in 2001. Many claim the hotel may be haunted because they say strange sounds and eerie voices have been heard inside the empty three-story brick building. There’s even a ghost-hunting class held there to take advantage of the spirits and apparitions that many say sometimes make themselves known. Now a museum, it was once the home of Joel Chandler Harris. It’s been called the Joel Chandler Harris House, the Wren’s Nest and the Snap Bean Farm. Built in 1870, it’s a Queen Anne-style Victorian house, one of the last of the originals still standing in Atlanta. Visitors to the Wren’s Nest claim they have been surprised by the appearance of small, ghostly children in and around the home over the years. They’ve also reported hearing the sound of children’s voices and laughter. As far back as most modern history buffs can remember, the location where Six Flags was built started as a farm in the early 1800s, then became a dairy farm, before the land was sold to the city of Austell, eventually becoming the site for Six Flags Over Georgia. According to several paranormal investigators, the park is seriously haunted. To many people, that’s not surprising. There have been deaths at the park and on the land before it became an amusement park. There’s even a cemetery in the middle of the park containing several graves that belong to families who owned the land, according to a local researcher. “The haunted house at Six Flags is, uh, actually haunted,” said paranormal investigator Roffe. Once known as the Winecoff Hotel, this renovated 1913 building was the site of the worst hotel fire, not only in Georgia history, but in U.S. history, too. Located at 176 Peachtree St., 119 people perished in December 1946 in a raging inferno in the middle of the night. There were no fire escapes or exits, although the tragedy did prompt immediate changes in building codes across the country. As far as hauntings go, witnesses have reported hearing screaming women and children, footsteps in the hallways and seeing apparitions in this now luxurious, world-class hotel in Midtown. The Estate on Piedmont Road in Atlanta, a historic mansion known as the Pope-Walton house, was once a restaurant, before its resurrection as an event venue. Photo by Brenna Beech/WABE. 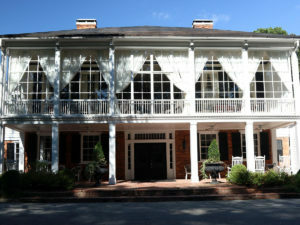 Once a restaurant called Anthony’s Fine Dining, the Estate is located at 3109 Piedmont Road and was originally the Pope-Walton Home, an antebellum style historic mansion built in 1797 in Washington, Georgia. It was taken apart, brick by brick and board by board and reassembled over a three-year period beginning in 1967 on a forested lot in Buckhead. There are plenty of accounts of strange noises, phenomenon and apparitions in this building. And really frightening, there are stories of a woman seen hanging herself from a tree in the front yard. The location is now a popular venue for hosting weddings, receptions, corporate gatherings and other special events. The Castle on Peachtree Street, as it is known, was built by furniture magnate Amos Rhodes at the turn of the 20th century. It was a well-known Halloween destination during the 1980s before renovations started on the historic location in the early 1990s. Rumors persist that the house is haunted by Mrs. Rhodes who is said to have died in the home. Paranormal researchers also say children have been heard laughing and that there’s an evil spirit that dwells in the home’s basement. The Battle of Kennesaw Mountain during the Civil War unfolded in mid-June and ended in early July of 1864. Union forces were defeated, but the loss did not stop Gen. William T. Sherman’s march south to Atlanta. Thousands of Confederate and Union soldiers lost their lives on the 2,888-acre National Battlefield in Kennesaw, Georgia. More than 67,000 soldiers were killed, wounded and captured during the fight, according to the website exploregeorgia.org. There have been reports of ghostly soldiers seen wandering throughout the battlefield and the sounds of cannon fire and gunshots. At least one ghost investigator reported having an unusual experience at Kolb’s Farm at the southern end of the battlefield in Marietta, having recorded strange and eerie EVP at the location. This store in Newnan, Georgia, may seem like a normal shop specializing in treasures from the past, but patrons of the store have reported odd experiences and unusual occurrences. A local paranormal researcher recounts the story of a scratch and blood appearing on her daughter’s leg during an investigation inside the store. Other claims of otherworldly activity include knick-knacks that fly off store shelves and the appearance of a ghostly hand.